My EU version plays very nice, without pops or cracks. It's not perfectly flat though. The sound is dynamic and well balanced for my ears. Inner groove distortion on side A's "Kiss With a Fist" and "Girl With One Eye" are tragic. 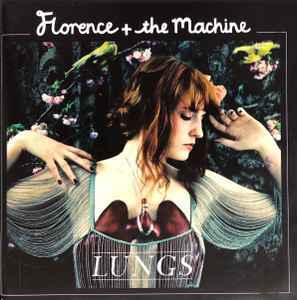 Florence's voice deserves much better. This is one of the best rock albums of the naughties, and could definitely do with an audiophile reissue. Maybe when it turns 10 in 2020. Not sure I can find my version. Printed on it, on the back near the barcode, an address ending with Malaysia. Some may have got the short end of the stick but fortunately mine plays beautifully. Reports seem quite mixed on this album's vinyl sound, I have both the US & European pressing and thought i'd share my thoughts to hopefully guide someone down the right path..
for what its worth my EU pressing is flat, on centre, no surface marks and very little crackling on playback, but I know from experience this is pure luck.. The EU pressing has a nice thick card printed inner sleeve, The US pressing has a thinner printed sleeve, which one is better?? down to personal preference, I carefully remove on 1st opening and after washing the vinyl use a separate MOFI inner to prevent and scuffs & ticks from the sleeve..
Playback, neither are audiophile quality but the EU pressing is streets ahead of the US pressing, almost night and day to me, The US pressing feels detached, flat, has an unpleasant tinny sound and Florence's vocals give a nasally sound whilst buried in amongst the instruments, the bass seems weirdly balanced too, to some it up best its as though your listening to it via your 90s Hi-Fi and someone as screwed around with your graphic equalizer settings. The EU pressing has nice clarity, punchy vocals and a good amount of bass, maybe too much for some but to me its about right, the vocals rises nicely above the backing tracks and are crisp and clear, quite loud! could give a bit of inner groove distortion on some systems if not using a good & well set up cartridge, Plus make sure its free from dust! you'd be surprised the level of IGD the smallest amount of dust on the needle can cause..
To sum up.. go with the European pressing, it wont guarantee you a well pressed vinyl but will give you a more pleasurable sounding vinyl. Final thought. The US pressing was cut by Sterling Sound, same as the US pressing of Adele 21 which also suffers from exactly the same sound issues. Playback, neither are audiophile quality but the EU pressing is streets ahead of the US pressing, almost night and day to me, The US pressing feels detached, flat, has an unpleasant tinny sound and Florence's vocals give a nasally sound whilst buried in amongst the instruments, the bass seems weirdly balanced too, to sum it up best its as though your listening to it via your 90s Hi-Fi and someone as screwed around with your graphic equalizer settings. I am not happy, something's not right with this album. Can't tell if the pressing or the production. How do I calculate the shipping price? Thanks. Had to turn bass down on my equalizer .It might sound ok on a cheap sound system , not on mine. No magic here as we always expect from playing a vinyl record.